A calf with chronic bloat shown with a trocar cannula in his side. “If you have to open up the rumen with a trocar, you can pour the mineral oil in through the trocar cannula. If it’s frothy bloat, foam may plug your stomach tube or trocar cannula. Make sure the gas is still coming through. You may have to wiggle and blow on the tube to clear it. With a trocar, the cannula stays in and you can push the trocar back through it to remove the blockage,” explains Carl Dahlen, beef specialist with North Dakota State University. 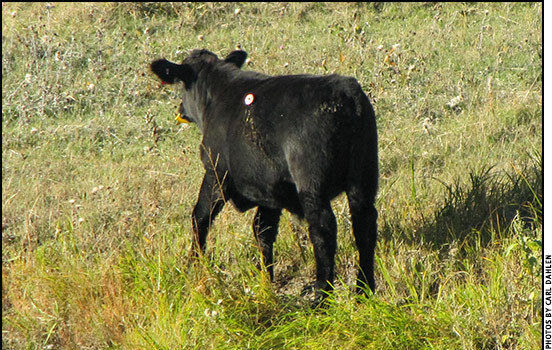 “When we move cattle into risky pastures, there will be some that bloat right away, but usually the greatest proportion will occur a couple days after they were put in,” warns Carl Dahlen, beef specialist with North Dakota State University. Many people think the first few hours are the most crucial, and that cattle will be fine if they don’t bloat that first day. However, they can still bloat several days later. The telltale sign is a distended rumen bulging upward on the animal’s left side. “If the animal is not in immediate danger of suffocating, use a stomach tube to let out gas and put in something to break up froth. This is the least invasive treatment. “If a stomach tube is not available, a garden hose works. Just cut the metal end off. If you are putting it down her throat, use something to keep her jaws apart so she doesn’t chew your hose in two. Ideally, use a speculum that you can thread the stomach tube or garden hose through, so she is chewing on that solid object rather than the hose itself. This is the same principle as inserting a nasogastric tube into the nostril to the back of the throat, where it must be swallowed. Once the tube is in place, allow gas to come out if there is a gas pocket and it’s not just froth. Then he recommends pouring in some mineral oil or anti-bloat product to reduce the amount of foam in the rumen. Once the rumen is no longer distended, continue to monitor the situation. A plastic trocar is installed in a bloating calf. If it’s a choice between cutting into her rumen or letting her die, most people will open it up and take their chances on possible infection. “If you have to open up the rumen with a trocar, you can pour the mineral oil in through the trocar cannula. If it’s frothy bloat, foam may plug your stomach tube or trocar cannula. Make sure the gas is still coming through. You may have to wiggle and blow on the tube to clear it. With a trocar, the cannula stays in and you can push the trocar back through it to remove the blockage,” he explains. 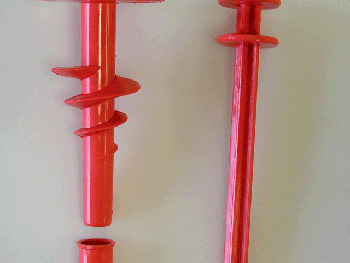 “I’ve used some of the little plastic screw-in trocars. A person can thread it right in there, and once it gets to a certain point it just locks in. We’ve used these in chronic bloating cases because you can just leave it in,” says Dahlen.